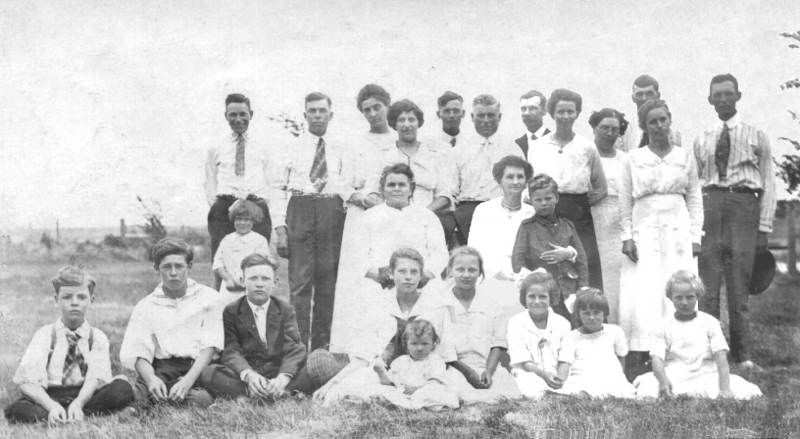 4th of July, 1919 (Fingersons unless noted otherwise) In the very front starting at left: Harold, Lester, Winford, Mildred Miller holding Winnie, Leona, Beulah, Helen Timm and Ilo. The four in the middle: Little Della (standing), Isabelle and May (sitting), and Martin Jr (Jay). The group in the rear: Ernie, Thomas, Carrie, Della, Martin Sr, Will Miller, Ole, Emma Miller, Inga, Fred, Lillie, and Fred Timm.